Formerly the home of the Duke of Norfolk, the hotel is a listed building which has been restored to its original Edwardian grandeur. 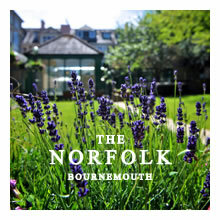 Spacious ensuite bedrooms and suites, a private garden and swimming pool located in the centre of Bournemouth with shopping, activities, nightlife and miles of golden sandy ‘Blue Flag’ beaches on the hotel’s doorstep, The Norfolk is perfect for leisure and family holidays. All public areas have full disabled access with washroom. The hotel has four disabled rooms specifically designed and adapted for people with physical mobility problems, providing some of the best disabled accommodation Bournemouth has to offer.